Nashville, Tenn. Sept. 5, 2018– – National Recovery Technologies (NRT) has integrated the company’s NRT SpydIR® optical sorter with Max-AI® technology, creating a revolutionary new sorter with detection abilities unmatched in today’s optical sorter market. 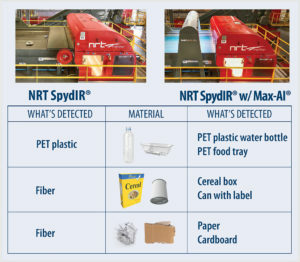 NRT’s SpydIR technology uses near infrared light (NIR) detection to identify plastics, paper, wood and other materials by material type. Max-AI technology uses artificial intelligence (AI) to identify materials using a camera and neural network algorithm (NN). 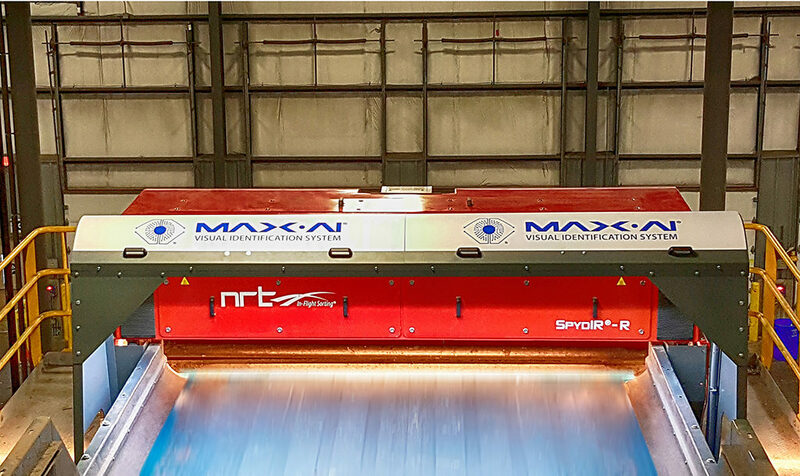 The NRT SpydIR with Max-AI optical sorter employs both detection technologies to create an optical sorter that is able to combine the information from each technology to deliver a unique sorting capability. In its initial installation At Penn Waste in York, Pennsylvania, Max-AI was integrated with a SpydIR unit that was designed to sort out paper at the pre-sort to a container line. The unit was seeing a significant quantity of steel cans with fiber labels which were being ejected by the optical unit. Max-AI is able to identify these cans and suppressed the firing signal in the optical unit to prevent contamination in the fiber stream. Not only is Max-AI able to identify this material, but it is able to do so at speeds of 600 fpm on the optical feed belt. Thus, material quality increased dramatically as did the recovery of both fiber and ferrous cans. “Competing in today’s recycling markets is tough,” said Penn Waste Director of Recycling Operations Tim Horkay. “Our investment in this new technology is immediately paying off with both higher purity of our fiber and greater recovery of steel cans. “Max-AI technology is remarkable in that it can detect multiple views of different material categories in one location using a camera and AI, similar to how a person can using his or her eyes and brain – the difference being Max can do this at very high speeds,” said NRT President Matthias Erdmannsdoerfer. “While our SpydIR line of optical sorters is fantastic at identifying materials very confidently at high volumes, it is limited to material composition analysis. Recyclers care about more than material type, and this is where Max comes in. We can now sort using the SpydIR’s speed and confidence while adding the criteria that Max is able to differentiate. For example, in a PET sorting application, while the optical sorter identifies the material PET, Max is able to differentiate between different types of PET like thermoformtray, redemption container, food-grade, rigid, bottle and more. Thus, the customer is able to produce a product with increased value at a minimal additional expense without the need to add labor. It is among the most impactful innovations in optical sorting in recent memory,” Erdmannsdoerfer concluded. Other examples of the capability of this combining of technology is shown in the accompanying chart. Headquartered in Nashville, Tennessee, NRT is a global leader in the design, manufacture and installation of optical sorting solutions. NRT is a member of the Bulk Handling Systems (BHS) Family of Companies, a worldwide leading provider of automated sorting systems to the waste processing and recycling industries. In Europe, NRT operations are headquartered in Amsterdam. Since its inception in 1981, NRT has been recognized as an industry thought-leader and innovator, and currently holds more than 35 U.S. and international patents. Today, NRT remains focused on technology innovation and offers industry-leading bottle sorting recovery and purity rates, thanks in part to In-Flight Sorting® and PET Boost® technologies. NRT holds strong commitments to equipment excellence and first-class customer service and support. Headquartered in Eugene, OR, BHS is a worldwide leader in the innovative design, engineering, manufacturing and installation of sorting systems and components for the solid waste, recycling, waste-to-energy, and construction and demolition industries. Wholly-owned subsidiaries include Nihot (Amsterdam), NRT (Nashville, TN) and Zero Waste Energy (Pleasant Hill, CA). BHS is also the home of Max-AI® technology, a breakthrough artificial intelligence that identifies materials, makes intelligent decisions and directs equipment such as robotic sorters. Clients around the globe choose BHS because of its experience, dedication to cutting-edge technology, quality construction and durability, and unmatched customer service. BHS has built some of the largest and most durable MRFs in the world – and they are achieving the highest throughput, recovery, and purity rates in the industry.